The Nuns of the Norbertine strive to be self sufficient and wanted a greenhouse to grow their own vegetables. Crop: A mixture of vegetables. 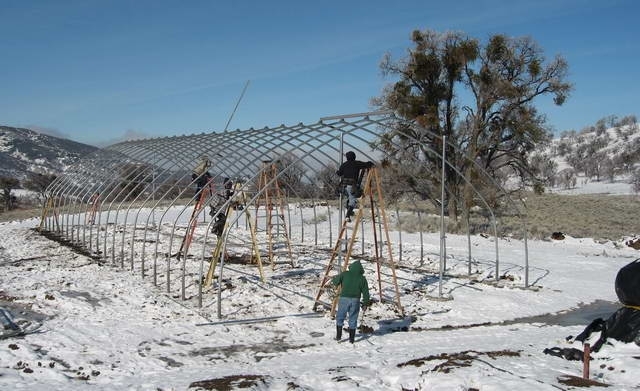 North Slope 30 x 84' long with twinwalled polycarbonate on the roof and walls. The greenhouse has a roof vent for natural ventilation. They grow directly in the ground and need to have the endwalls open completely up so they can drive through the house with a tractor. There are three sets of double sliding doors in each endwall so the tractor can drive through at the center of the house and at each sidewall.